Hyderabadi Khatti Dal – Toor Dal / Split pigeon Peas cooked with onions, tomatoes and tamarind.Super Delicious Sweet and Sour Dal which packs a punch of flavours! The name literally translates to Hyderabadi Sour Dal.It’s one of those “learn it once and make it everyday kind of recipe”. 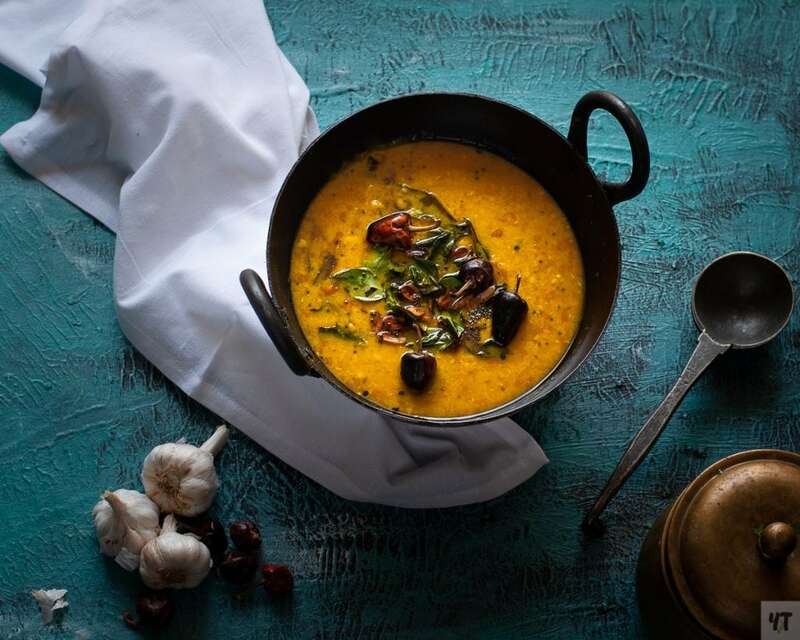 Although the dal is simple to make, it has very BOLD flavours.It has heat from the various chillies, sweetness from the palm sugar or jaggery and sourness from the tamarind.The Curry leaves and coriander leaves lend a gorgeous freshness to the dish. How to make Hyderabadi Khatti Dal? Boil the Toor Dal along with Onions, Tomatoes, Chillies and Garlic. This dal can be boiled in an Instant Pot, pressure cooker or a heavy bottomed pot.Though it will probably take 3 times the cooking time in a heavy bottomed pot. What I love the most about this dal is the almost no chopping and sautéing involved.Except for the tempering, which doesn’t take too much effort this is a a dump it all together (well almost!) kind of a dish. Mash the Dal after pressure cooking very well.This will make sure the boiled onions and tomatoes mix up well. Smoke the chillies without any oil before adding to the tempering.This will give the dal a lovely smoky flavour. Slice the garlic super thin and brown them while tempering.This will amp up the garlic flavour more! I don’t know anyone who will ask this question! I mean it’s your dal, eat it however you want. But I will still answer it.Just in case! I loooourve this dal with white rice.It’s the ULTIMATE comfort food.If you are an Indian reader then you will agree with me! There is nothing like Dal Chawal.PERIOD.EVER! What would be even more EPIC is when it’s served with some nice spicy potato dish or Chicken Keema. Ignoring what I said above, the dal is SUPER HEALTHY if served with the right side. You can add any kind of green vegetables like Spinach or Kale or whatever is in your fridge to amp up the nutrient quotient of this dish. Also! serve this dal with millets or cauliflower rice for a super low carb meal. Hyderabadi Khatti Dal – Toor / Split pigeon Peas cooked with onions, tomatoes and tamarind.Sweet and Sour Dal made in instant pot and pressure cooker! In a pressure cooker, add the Dal, onions, tomato, garlic, ginger, turmeric, asafoetida and green chilli. Add 3 cups of water and Season with salt. Pressure cook this for 20 minutes on medium-high flame- roughly 5-6 whistles. Let the pressure release naturally. Mash the dal well. Dry roast the red chillies to almost black.Remove and reserve. Add the ghee in a tempering pan(or a small pan). Once hot, add the mustard seeds.Once they start to splutter add the curry leaves and garlic. Switch off the gas, break the chillies and add to the tempering. Pour the tempering over the dal, garnish with coriander leaves and serve!